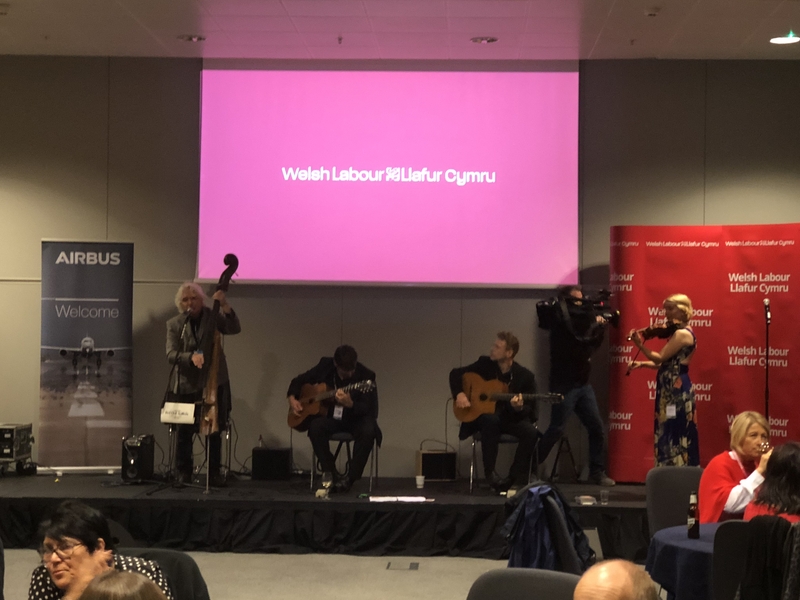 Last night was brilliant- Welsh Labour Night was fun, despite me not really knowing many people to begin with (Nia Griffith soon remedied that), got to meet some new people and also catch up with comrades of old. I fully intended to crash the South West reception, but by the time I realised what time it was, it was pretty much time for me to crash out. Today was very different. I had 3 events that I really wanted to go to and all three were very pointed and motivating. However this positiveness was somewhat balanced out by the news from the conference floor that we are more concerned with more internal party fighting, than coming up with policy with which to take on the Tories. Starting the morning looking round the exhibition hall, and there were a lot of interesting stalls and you can tell a definite change in theme and indeed number of the stands. If you can measure how people perceive our influence by the number of people who want to get our attention, then this is a definite decline over the past few years. But from what was there, some were very interesting, including outreach programmes for digital literacy from Google, someone had an autonomous car, but that stand wasn’t manned so will need to go back tomorrow to look again. First event I went to was the Police and Crime Commissioners Fringe. Many will know that justice is something close to my heart and its good to see that Labour seems to be finally accepting PCCs and the value they bring when in power. Some of the work around misogyny and hate crime, coupled with a sobering view on the challenges we face was sobering but inspiring when you see what Labour can do when elected pretty much anywhere. I still feel we do not give PCCs enough of a platform in the party, yet, especially coupled with a Labour council can really delivery social justice change in communities. I was pleased to see a very full room which it hasn’t necessarily been int he past, and i was gutted to have to leave early but my next even awaited across the other side of the docks. The next event was a Fabian led discussion on our Defence policy. Included were Nia in her role as Defence Secretary, Wayne David in his role as Defence Minister, Paul Mason and Dr Lina Khatib. The conversation was very wide ranging, from Russia and their activities, Cyber capabilities, the effectiveness of military deterrents, and the defence industry. There was a lot of talk on Russia, and the whole panel were quite strongly highlighting that they are up to questionable activities on many fronts, and that we need to send a strong and firm message that it should not be tolerated. Cyber and the hybrid warfare was engaged with, but i do think that many people struggle with the cyber concept and it being a form of warfare, i guess because it is primarily a soft effect or a hearts and minds effect that comes across, it is difficult to see the relevance. I think that highlights how we have to change our language and education on it. I was lucky enough to get to ask a question, which was around if we need to look at developing more sovereign capability for the future and not rely so much on international projects, such as Typhoon and F 35, especially with Brexit and the USA not being as stable as we are used to. There was some excitement when all the panelists agreed that we shouldn’t be watching or giving influence to Russia Today, though one audience member was most put out by that. For me out of this event, there were two stand out statements. Firstly from Paul Mason who strongly pushed the need for us to educate newer members in the need for a strong and sensible defence policy, and from Nia, who was very firm in that Labour in Government needs to look to the defence of our people as our first and most important job. My approximation of her intent does terrible justice to her actual words which I wish I had written down. My final event of the evening was the Progress Rally. It was a really good event and in many ways I wish a lot of the speeches could be played on the conference floor, because all of them were about Labour staying together, Labour and the value of the broad church, Labour standing up and fighting the Tories. But many went further and challenged us to stop thinking about sitting on our hands, to stop thinking that the madness will end soon. A strong drive to get back on the doorstep and fight for a Labour government, but to stop looking back and seeing what good things Labour has done in the past and highlighting those, but to highlight what a new Labour government can to, to give people something to hope for. All the speeches were great, but for me there were two stand out ones, Alison McGovern who told us about her time working with Care workers and how we should be helping those who care for us and treat them with more respect. And Luciana Berger, who has had a torrid summer of , in her words, boxes of letters and emails of hate. She got a standing ovation, and that was before she started her speech. Then finally we get onto the long late meeting on the composite motion for the idea of a peoples vote. On one hand, we have a vote and that’s brilliant, but its a silly stupid fudge. The basic gist is that if MPs vote it down in Parliament, then we will look at other options including peoples vote. We don’t get anywhere by being so vague. Ironically the MP vote is something I strongly believed in over a peoples vote. But I am so pissed off with how this is being mishandled in parliament, then I think a peoples vote is necessary. So rather than the two pages of A4 that is currently the composite which is full of well meaning waffle, it should simply read “Labour will campaign for a peoples vote.” Simple, unambiguous statement of intent. So why does my headline say it was half a story? It was inspired by Paul Mason who, in hos remarks, commented that many of the new labour members were not at conference, they were at “The World Transformed”, the Momentum conference down the road. This is a major problem because conferenec is were a lot of policy is highlighted, debated and discussed, if the majority of new members are not turning up and going to a Momentum version which is on at the same time, then how are they going to get heard. Democracy isn’t just about card votes and last months meeting minutes, its about having grown up debates. If Momentum is serious about being for the good of the country and not just themselves, they should have their conference at a different time, they could do it the week before or make it a couple of months earlier or later to work with Labour conference. At the moment, their voice isn;t being heard in the stuff that matters, the events that will shape how we should fight the Tories. All we are hearing is how they want to deselect MPs. 2019 – Come on then! Welsh Labour Leadership – Any the wiser?